Demek CNC OÜ supplies metal machine tools, accessories and equipment. We offer automation solutions, and repair and maintenance services for metal machine tools. We offer a complete solution that includes the selection of equipment necessary for production, its installation and maintenance, technology development, training, programming, and automation of production. Demek CNC’s key advantages are its competence, flexibility, and response speed, along with employees who have been working in this field for 10 to 30 years. We also have long-term experience in finding a complete solution for the client. Our main clients are metal machining companies, but we also provide automation solutions for the electronics, food and lumber industries, and other companies. We represent the best-known and best-quality brands in our industry. 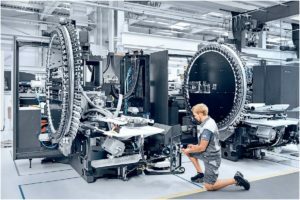 DMG MORI is the market leader in the industry, formed by the merger of three large companies – Deckel Maho, Gildemeister and Mori Seiki. DMG MORI is characterised by the German and Japanese quality achieved through decades of experience. Wide range of products and the most advanced technology that primarily proceed from Industry 4.0.